Bluetooth is new technology that consumers have been hearing rumblings about for some time now. It is finally starting to show itself outside of the trade show floors which is a pretty cool thing in itself. What Bluetooth really represents is a "wireless personal connectivity standard" and what Bluetooth does is enable short-range wireless connections between computers or mobile devices which support it. "Bluetooth" is actually the name of the standard, which is controlled by Bluetooth SIG , a large consortium of big companies including; 3Com, Ericsson, Microsoft, Nokia, Agere, IBM, Intel, Motorola and Toshiba. Investigating further we find out that chip in Epox's Bluetooth gear is made by Cambridge Silicon Radio ( www.csr.com). While we can't tell for sure, we expect the chip in use is the BlueCore2 which is a 0.18 micron BGA chip with integrated baseband DSP, radio, and on chip RISC microcontroller. Bluetooth data transfer rates hover around 723Kbps (Kilobits ) over a max +4dBm 2.4GHz wireless signal. The 2.4GHz ISM band is the same one used by many cellphones, and 802.11b wireless LAN, but the two are not interoperable. The Epox adaptors have a listed range of about 30 meters in an open, unobstructed area. Once you start putting things like walls, people, and computers in the way of the transceivers that distance can be cut down. "Unlike many other wireless standards, the Bluetooth wireless specification includes both link layer and application layer definitions for product developers which supports data, voice and content-centric applications. Radios that comply with the Bluetooth wireless specification operate in the unlicensed, 2.4 GHz radio spectrum ensuring communication compatibility worldwide. These radios use a spread spectrum, frequency hopping, full-duplex signal at up to 1600 hops/sec. The signal hops among 79 frequencies at 1 MHz intervals to give a high degree of interference immunity. Up to seven simultaneous connections can established and maintained." Services supported: Dial-up Networking, Fax, File Transfer, Information Exchange, Information Synchronization, Network access. Bluetooth operates in a "client" and "server" framework. With a wireless connection the client sends out a request to the server asking for a connection. 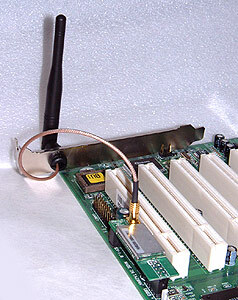 The server, which can be a remote computer, mobile device or even a printer must accept that request before a connection can be established. Most Bluetooth devices can operate as both client and server, and the software needed to setup that connection runs in the background. Once again though, with its maximum transfer speed sitting at 732 Kbps, Bluetooth is not really intended for LAN gaming or internet sharing home networks. It's good for sending things to a Bluetooth compatible printer like the kind HP have recently put to market, or for transferring small files between adjacent computers. To test out the Epox Bluetooth setup, we connected the transceiver to the 8K5A2+ and the dongle to another computer located a few feet away. A 1 MB dummy file was transferred between the two computers and this took approximately 18 seconds to complete.